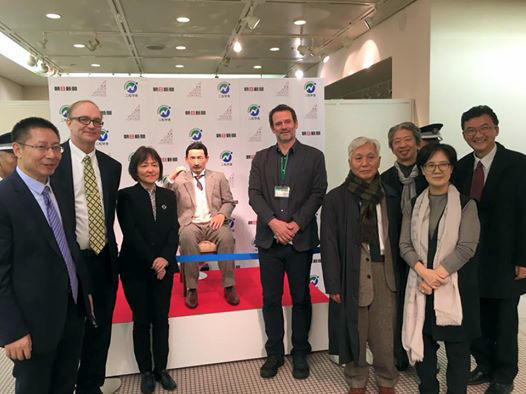 The Japan Foundation co-hosted a symposium to commemorate the centennial of Natsume Soseki's death in collaboration with Ferris University, the Asahi Shimbun, and Iwanami Shoten from December 8 through 10, 2016. Reiko Abe Auestad, one of the speakers at the event, wrote about her impressions from the symposium and the talk she presented. 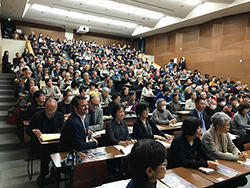 The Natsume Soseki International Symposium was held at Ferris University in Yokohama and at Yurakucho Asahi Hall in Tokyo over three days centered on December 9, 2016, the 100th anniversary of the death of Natsume Soseki. The symposium was divided into two sections entitled "How Did Soseki Read the World?" primarily featuring Japanese researchers, and "How Does the World Read Soseki?" primarily featuring overseas researchers. Prior to this, on the eve of the anniversary, the curtains rose to the keynote speech given by Yoichi Komori, professor at the University of Tokyo, entitled "Natsume Soseki as World Literature." In this lecture, he demonstrated through his text analysis how the memories of readers who lived through the same period of rapid change as the author, right after the Meiji Restoration, were evoked through the process of reading. The first part of the symposium on the next day consisted of comparisons of Soseki's works with English, Western, and Chinese literature. Many fascinating talks were given on such topics as the relation between the tradition of satire in English literature and The Three-Cornered World, Soseki's critical views of Western literature as observed from the notes he inscribed on the Western literary works he owned from the period, and how Soseki had affection for, and was particular about, classical Chinese poetry specifically because it was an art form from the past. Soseki's observation that the twist at the end of Maupassant's The Necklace was like a punchline in the Japanese rakugo and was thus "too clean an ending" to be interesting left a special impression. It certainly seemed to echo the words of Kenzo, the main character in Grass on the Wayside, who said "Hardly anything in this life is settled." In the second part, his grandson, Fusanosuke Natsume offered a glimpse of Soseki's life by talking about manga and behind-the-scenes stories that only family members know. This rang convincing perhaps because I had just also watched the drama series Natsume Soseki and his Wife on NHK. Finally, in the last talk, entitled "Soseki as Read by Women," a fresh observation was made suggesting that in the context of modern family ideology, the male lead characters were struggling hard to be good husbands and good fathers, however clumsily. Though I grew up in Tokyo, it has been 20 years since I took my job at the University of Oslo in Norway, and having also written my doctoral thesis on Soseki in English, I joined the panel entitled "How Does the World Read Soseki?" at the Translator's Symposium on the second day. This day featured talks on subjects as translation as a form of betrayal, the audible impression of words making its way into translation, the complicated reception of Soseki in Korea under colonial control, and the 19 different Chinese translations of I Am a Cat. I myself spoke of Soseki's stylistic experiment of using third person past tense in Light and Darkness. I examined the way in which the experiment was received differently by foreign readers and Japanese critics, depending on their preconceived notion about Japanese writing. 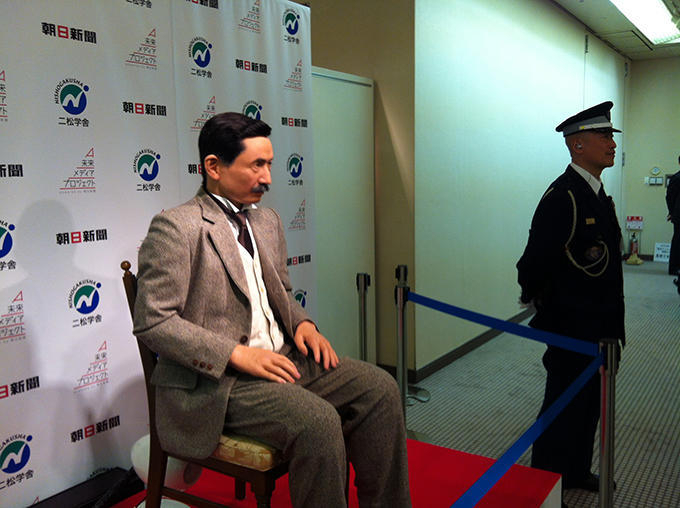 The awards ceremony for the Soseki International Essay Contest entitled "Soseki and I" was also held at the same venue, after which an android modeled after Soseki was presented. The android spoke the phrase "thank you for waiting a hundred years," which, in the recorded voice of his grandson Fusanosuke Natsume, sounded like a ghostly echo from Ten Nights Dreaming, and gave me a feeling that I had just met the man himself. The face of the android, apparently created using Soseki's death mask, looked the same as that with which we are familiar from the old 1,000 yen note, and its staring eyes, and subtle hand movements almost gave the impression that the dead author was actually alive, uncannily resuscitated. Incidentally, I was surprised by the number of attendees when I arrived at each venue, both at Ferris University and Yurakucho Asahi Hall. The three days apparently saw the attendance of over 1,500 people, and I was once again impressed by the great respect for Soseki in Japan that was capable of filling the venues completely with attendees likely from among the general public as they certainly did not look like students. At the same time, I had the sense that it would take more time for Soseki to become an author who could resonate with the general readership throughout the rest of the world. Thus, the translation of Soseki should continue even if it were to "betray" his supposed wish. As said by Associate Professor Hongzhi Li, the fact is that "If 100 people read Soseki's 'I am a Cat' then there would be 100 cats," and 100 different translations would not be too many. To put it another way, there is still room for further efforts among researchers and translators. In closing, I am extremely grateful to have been able to make new acquaintances, and deepen my relations with existing friends, through my research on Soseki, and I would like to express my deepest gratitude to Professor Yuko Sato, her associates at Ferris University, and to the rest of the staff, who have worked on this plan behind the scenes for the past several years. * Original text in Japanese, translated into English by the Japan Foundation. 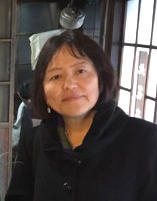 After obtaining her master's degree at the University of Wisconsin and her doctorate at the University of Oslo, Reiko Abe Auestad became a professor at the University of Oslo specializing in modern Japanese literature. She has written about Soseki in such works as Rereading Sôseki (1998、2016), and "Kokoro wo Kakuran Suru Jodo" [The Affect that Disorients Kokoro], (Nov. - Dec. 2014 issue of Bungaku). She is currently editing a collection of essays on Soseki together with Alan Tansman and J. Keith Vincent.